This quark pastry recipe is a quick and great alternative to flaky pastry and puff pastry. 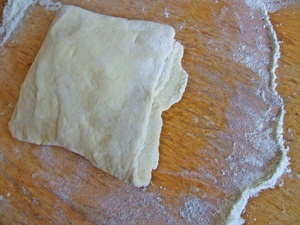 In our family it is also called "fake puff pastry" or basic flaky pastry. And the best thing about it : it is so easy and uncomplicated to prepare, you have to mix three different ingredients. And the pastry is very versatile, you can use it to make Strudel, give it a fruity-sweet filling or a savoury spicy stuffing. My aunts used to make this quark recipe, when we had family gatherings – rolled it out, cut it into stripes, some paprika and caraway on top and into the oven. Yummy nibbles – and so 70ies. Either you need more or less weigh in grams or ounces, it is rather easy to vary this recipe, as you need as much flour as you need butter and as you need quark. The typical size of quark here is 250g so you can of course use this as your basic measurement. You can freeze the dough you will not use and take it out when there is a family gathering or a football match on the TV and make some yummy snacks, nibbles or finger food. The measurement as mentioned above is fine for a middle sized strudel or a baking tray full of nibbles. 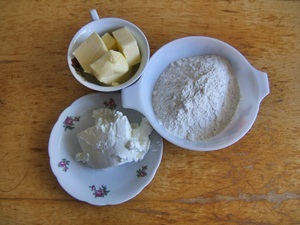 mix by hand or use a food mixer. Cut up butter in chunks, to make it easier to mix. Depending on how much time you have at hand, you can now leave the pastry in the fridge for 30mins. 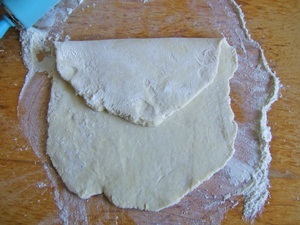 Or – you can make sure to have an extra flaky and fluffy dough, by folding it. 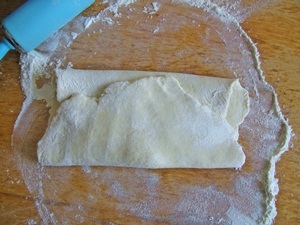 That's how we made it: roll the dough, fold the upper third down to the middle, fold the lower third up, and then fold again the right side to the middle – giving you 6 layers. As you saw in the picture make it quick and easy, no perfection needed here. Let it chill for 30mins, we recommend to cover the dough. 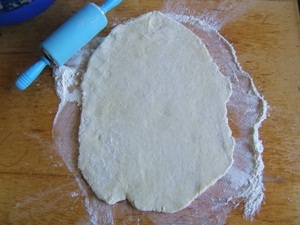 After cooling the fake flake pastry you can roll it out and use it as you like. If you cut it out, you can put the leftovers together and roll them out again. A quick and easy recipe – that means you can make this together with your kids or leave it completely up to your children to make this. If you are on vacations in Austria and your apartment or chalet kitchen has an oven – than this is a perfect typical Austrian recipe. You can knead it by hand, to roll out the dough you don't need to have a roll pin, but can use a clean bottle (well, clean from the outside, the wine is allowed to stay inside). You can either make a strudel filled with seasonal fruit or a spicy version with minced meat or broccoli and cheese. If you are rather up to a nice Chalet evening with friends, make some finger food – with this recipe for cute and spooky nibblies. Snacks with chill-factor are perfect for Walpurgis night, Halloween and of course with parties and sorcerer-themed celebrations – our recipe is perfect for kid's parties, so it won't be too spooky. 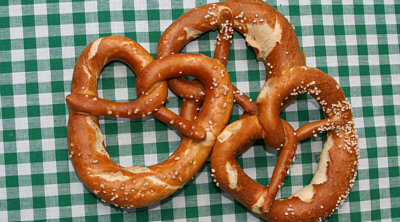 Looking for a snack recipe when watching Euro Cup: give our football player crackers a go.